What snake is this in my garden? Quote Reply Topic: What snake is this in my garden? 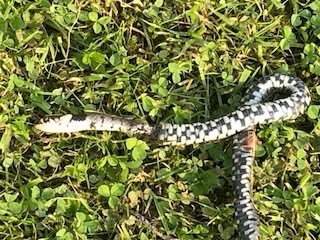 Hi all, my children found this snake in our garden unfortunately it was dead so not sure if a bird of prey had dropped it or not. However I am keen to find out what species it is as obviously concerned for my children should his be venomous. Hope you can help many thanks. Nothing to worry about - a grass snake, completely harmless - although smelly when provoked! Although not clear on the photo there is a yellow "collar" behind the head which is instantly identifiable.